I always complete two tasks in the beginning of all of my purchase decisions. The first is to examine all of the customer feedback that I can possibly find. The second is to carefully weigh all of the advantages and disadvantages of products and/or services that I am considering. I am even more vigilant about this when it concerns my children, even the fuzzy ones. What is inside the Mapping Pet Fence System Package I Received? How does the Wireless Mapping Pet Fence operate? This transmitter signals at a range of 90 feet in every direction. The user manual explains how you should post the training flags. The flag locations are recorded by the base station upon the initial set up. There are 5 levels of correction, the first being audible only. When your dog decides to stray outside of the boundaries you have set the systems sends a signal and the device on the collar your animal is wearing emits a correction. If the device is on the tone only level, it will only be a sound that he/she finds annoying. If the device is set to a higher level, it will emit both an audible warning as well as a mild static correction to alert him/her, as well as you, that he/she has strayed outside the boundary. What does unlimited number of canine use mean? This product may be used with an unlimited number of canines. This means you can boundary train all of your beloved furry buddies. The package includes only the first collar and if you want support for more dogs, you’ll need an extra collar receiver (amazon link). Will this device harm my canine friend? No, this device will not harm any living creature. The audible warning is only annoying and the static emissions are mild, even at the highest level. It will, in some cases correct your baby accidentally, if the device is worn inside in close proximity of the base. This is known as indoor interference. You should turn the device off or remove it from your animal’s neck while he/she is inside the home. How do I use the recharging device? The charging device plugs into any standard 110 volt household outlet. To gain access to the jack you must lift the rubber plug. These will only fit together one way. Never force them together. When you have the collar receiver properly seated into the charging jack the indicator light will glow red. Once the charging process is complete, the indicator will glow green. It generally only takes 2 to 3 hour for the charging process to be completed. The charge will last approximately 9 days, or less, depending upon the amount of use. The receiver needs to be completely charged in order to program the perimeter boundaries. Do not charge the device too frequently. This will have a negative result in the life of the battery. It is best to only charge the receiver when the battery indicator light pulses green/red or red. Will the PetSafe Wireless Mapping Pet Fence System work for my Pekinese? This training fence system should only be used with canines who weigh 15 pounds or more. This means small/medium, medium, and large breed canines. Some small breeds, at the larger end of the scale, can weigh 15 to 22 pounds. It is not recommended to use this particular system on extremely large breeds or those weighing more than 100 pounds. What if my fuzzy critter gets caught in the rain? The Wireless Mapping Fence system is waterproof. Your fuzzy critter will not suffer in any way, if he/she gets caught in the rain. It is not recommended that this device be placed into your dish washer. It should also not be washed in the washing machine. It is best to remove the Receiver Collar from your dog’s neck before washing it and simply use a wet cloth to wipe it down. Make sure it has dried completely before replacing it around your animal’s neck. Will this PetSafe Fence detour other dogs? No. This PetSafe Fence only works on animals who are actually wearing it. Will this system work on my rescued baby? That is a complex question. While the device may or may not work on a rescue animals, it is not recommended for use on an animal who has been retrieved from poor living conditions. In fact, it should never be used on any canine with a psychological or physical condition. The Receiver collar should also not be used on a dog who is recovering from surgery or injury. Using this, or similar devices, in any of the above mentioned situations can have extremely negative effects on your baby. 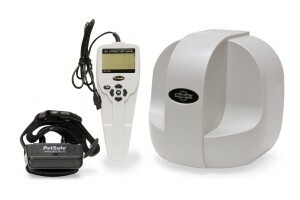 The PetSafe Wireless Mapping Pet Fence System includes a 1 year non-transferable limited warranty. You should visit petssafe.net in order to investigate the complete detail of this warranty prior to purchasing the system. You should not use this systems on your dog, if he/she is overly aggressive. Using it may cause the animal’s aggression to increase. You should never use this device on any species of animal other than canine. Do not leave your dog unattended while he/she is wearing the Receiver Collar. It is best to remove the Receiver Collar while your animal is inside the house. There is a signal confusion known as indoor interference which may result in your dog being accidentally corrected. This system should never be used as a solid deterrent. Do not use it as assurance that your dog will not enter the road or another dog’s territory. The PetSafe Wireless Mapping Pet Fence System is an excellent resource to teach your dog where your yard boundaries are. Most dogs of varying temperaments learn very quickly where safe zones are. It is waterproof and harmless to your animal. Make sure to check out Amazon.com’s price on this PetSafe Fence before you decide to purchase it.